^ 1.0 1.1 APTA transit ridership report, Third Quarter, 2017 (PDF). American Public Transportation Association: 36. 2017-11-17 [2018-01-24]. ^ "Traffic authorities from all over world see subway opened", 多倫多星報, 23 March 1954, p. 3. ^ Joseph Hall, "Ten Years After", Toronto Star, 6 August 2005. Retrieved 30 December 2009 via Transit Toronto. ^ Kalinoswski, Tess. A $17,5B transit promise. Toronto Star. June 16, 2007 [2007-06-17]. ^ Patton, Jessica. New Toronto-York Spadina Subway Extension officially launches. Global News. 2017-12-17 [2017-12-18]. ^ Kalinowski, Tess. So what happened to those TTC improvements?. Toronto Star. March 4, 2011 [March 31, 2012]. ^ Tapper, Josh. Long-running subway car takes final journey. Toronto Star. January 27, 2012 [March 31, 2012]. ^ Toronto Transit Commission Report No. ?? – Scarborough_Subway_Extension_Update (PDF). Toronto Transit Commission: 1. June 24, 2014 [2014-10-30]. 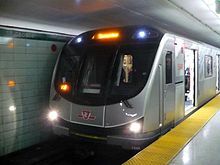 ^ A Scarborough Subway: Do the Numbers Add Up?. The Globe and Mail. July 4, 2014: 1 [2014-11-05]. 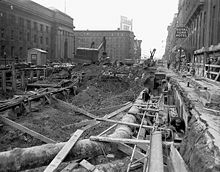 ^ 12.0 12.1 Scarborough Subway Extension: Fast Facts. 多倫多市政府、TTC. [2018-01-24]. ^ TTC Scarborough Subway Extension Project. TTC. [2018-01-24]. ^ Pagliaro, Jennifer. Updated Scarborough subway costs won't be published until after 2018 election. 《多倫多星報》. 2017-11-22 [2018-01-24]. ^ 25：18票 市長福特地鐵夢碎 多市輕鐵方案去馬. 《星島日報》加東版. 2012-02-09 [2012-11-30]. ^ Mayor Rob Ford loses Toronto subway vote. CBC News. 2012-03-22 [2012-11-30]. ^ Jonathan English. The Downtown Relief Line Proposal. Transit Toronto. 2006-11-10 [2008-09-16]. ^ Donovan Vincent. City favours relief line over subway. Toronto Star. 2009-01-29 [2009-01-29]. This page is based on the Wikipedia article 多倫多地鐵; it is used under the Creative Commons Attribution-ShareAlike 3.0 Unported License (CC-BY-SA). You may redistribute it, verbatim or modified, providing that you comply with the terms of the CC-BY-SA.